Storm Slabs form when new snow consolidates over a weaker layer or interface. The weak point can be snow that fell early in the storm or just a poor bond with the old snow surface. Like a chain, it can just be the weakest part of a snow layer that formed in a single storm or prolonged snowy period. Storm Slabs commonly form during periods of light or no wind. Storm Slabs tend to form in sheltered areas where new snow falls with light winds. They can occur on any steep open slope, and are often found on several aspects at the same time. Storm Slabs tend to have a short life span. They are easiest to trigger during periods of heavy snow and typically stabilize within a day or two after the storm cycle has ended. Storm Slabs can be difficult to recognize since the surface snow is often soft and powdery. With enough cohesion in the new snow, these slabs can propagate shooting cracks and faint collapses at the interface of the new snow and old snow surface. Snowpack tests that load the snow from above (e.g. Compression Test) have limited utility since they often crush through storm slabs and buried weak layers, and do not identify the problem well. Tilt tests, ski cut results on small inconsequential slopes, or natural activity on indicator slopes are often the best clues that a Storm Slab problem exists. A small Storm Slab triggered by a backcountry skier. Storm Slabs are most dangerous when they run into terrain traps such as timber, gullies, over cliffs, or areas difficult for a rider to escape off to the flank. Due to the nature of the soft, low-density slab, riders may not realize that a Storm Slab has failed until well after it is running. It is common to underestimate the extent of propagation with soft Storm Slabs, and resulting avalanches are often larger than expected. You can reduce your risk from Storm Slabs by waiting a day or two after a storm before venturing into steep avalanche terrain. They usually stabilize in less than a week, so you can reduce your risk by waiting several days after a big loading event. Experienced riders can use slope cuts as a tool to help release a Storm Slab. Under most conditions, good planning will allow a group to recognize terrain traps as well as good escape routes prior to a triggered a Storm Slab. However, Storm Slabs, can trigger avalanches into deeper, old-snow layers. 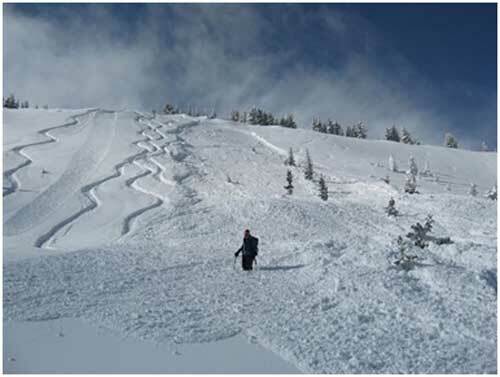 This scenario can lead to a much larger and more dangerous avalanche.